58 MMS March 2017 mmsonline.com QUALITY GAGING TIPS Columnist Measuring a part for size variation is relatively straightforward. 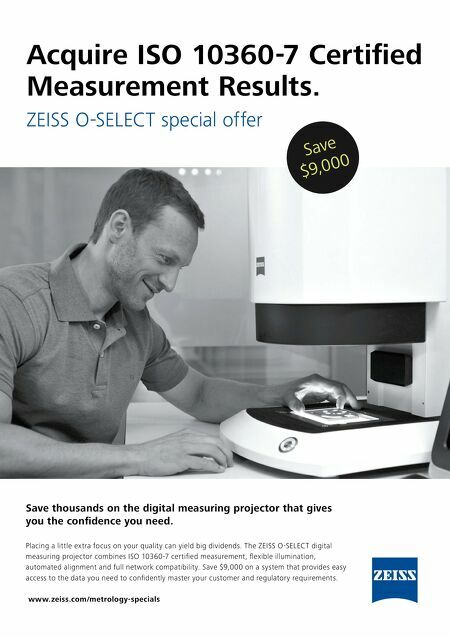 There may be hundreds of ways to measure a 20-mm inside diameter, but that list can easily be narrowed down based on the location of the check, its tolerance, how many parts need to be measured, the skill of the inspector, and possibly the surface finish and form of the parts. With the specification for the tolerance of the diameter, there is also likely to be a form require- ment, such as roundness, squareness, straightness, or even concentricity or cylindricity. Circular-geometry gages, with their precision spindles, are the standard and the best method for measuring out-of-roundness. But these can be elaborate pieces of equipment (especially those that can measure concentricity and cylindricity), and they are usually confined to applications where a very high degree of accuracy is required concern- ing part geometry. Most jobs, however, have fairly simple require- ments for roundness. While a true roundness measurement requires a complex description of the geometric and dimensional relationships of dozens or hundreds of points on a diameter, most job specifications simply call for parts to be round within a certain fraction of an inch. In other words, a rudimentary interpretation would say that as long as the diameter variation is within the roundness call-out, the actual shape of the surface is second- ary. The same can be said for squareness, straight- ness, concentricity or cylindricity requirements. This being the case, there are ways to approach the problem of form measurement that can provide a pragmatic, low-cost alternative to the circular- geometry gage. Although these methods rarely give a technically accurate measurement of round- ness, they are often close enough to give a good indication of the functional implications of an out- of-round condition. 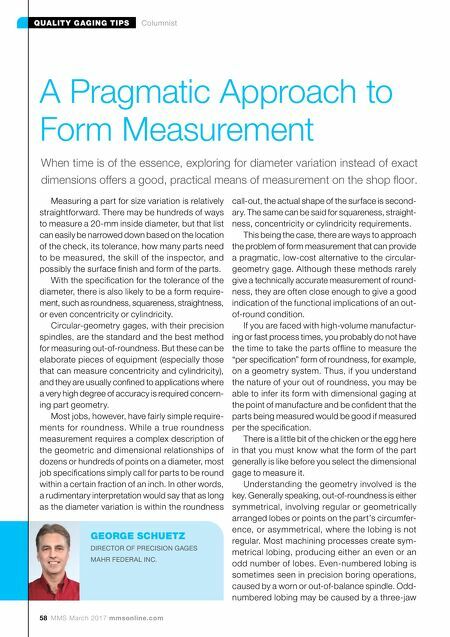 If you are faced with high-volume manufactur- ing or fast process times, you probably do not have the time to take the parts offline to measure the "per specification" form of roundness, for example, on a geometry system. Thus, if you understand the nature of your out of roundness, you may be able to infer its form with dimensional gaging at the point of manufacture and be confident that the parts being measured would be good if measured per the specification. There is a little bit of the chicken or the egg here in that you must know what the form of the part generally is like before you select the dimensional gage to measure it. Understanding the geometry involved is the key. Generally speaking, out-of-roundness is either symmetrical, involving regular or geometrically arranged lobes or points on the part's circumfer- ence, or asymmetrical, where the lobing is not regular. Most machining processes create sym- metrical lobing, producing either an even or an odd number of lobes. Even-numbered lobing is sometimes seen in precision boring operations, caused by a worn or out-of-balance spindle. Odd- numbered lobing may be caused by a three-jaw A Pragmatic Approach to Form Measurement When time is of the essence, exploring for diameter variation instead of exact dimensions offers a good, practical means of measurement on the shop floor. GEORGE SCHUETZ DIRECTOR OF PRECISION GAGES MAHR FEDERAL INC.